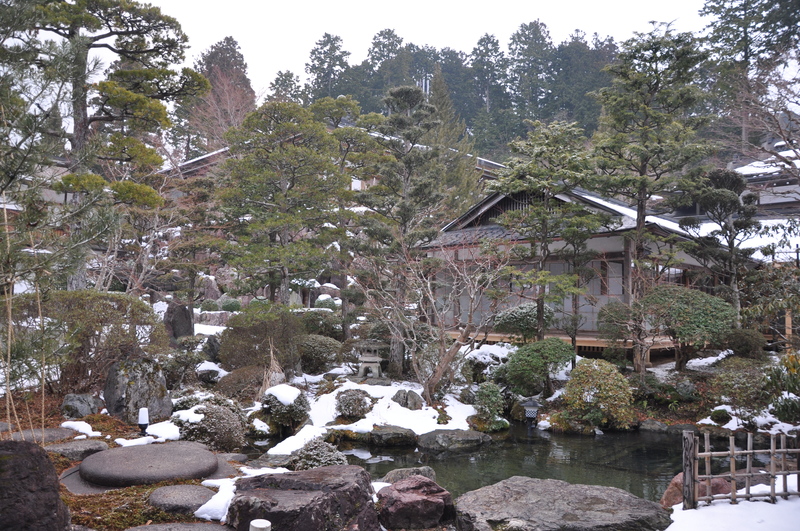 Koya San – Beautiful mountain town! 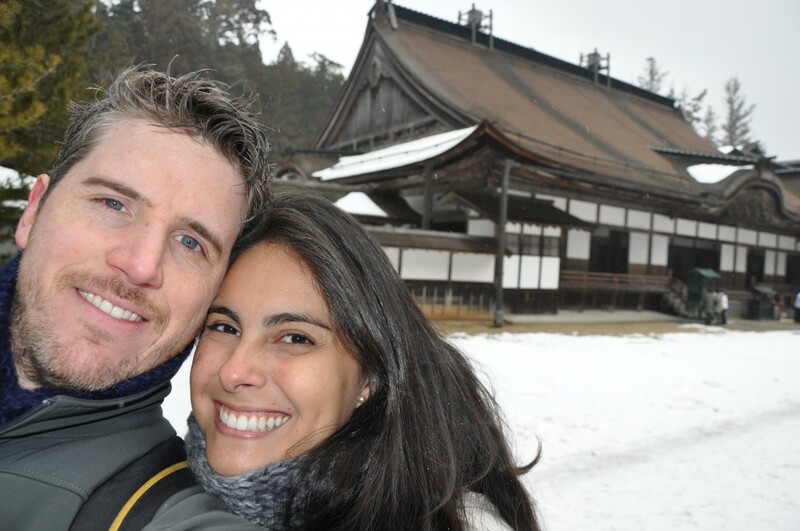 If you haven’t read our introduction to our trip to Japan, we suggest you read that first here. 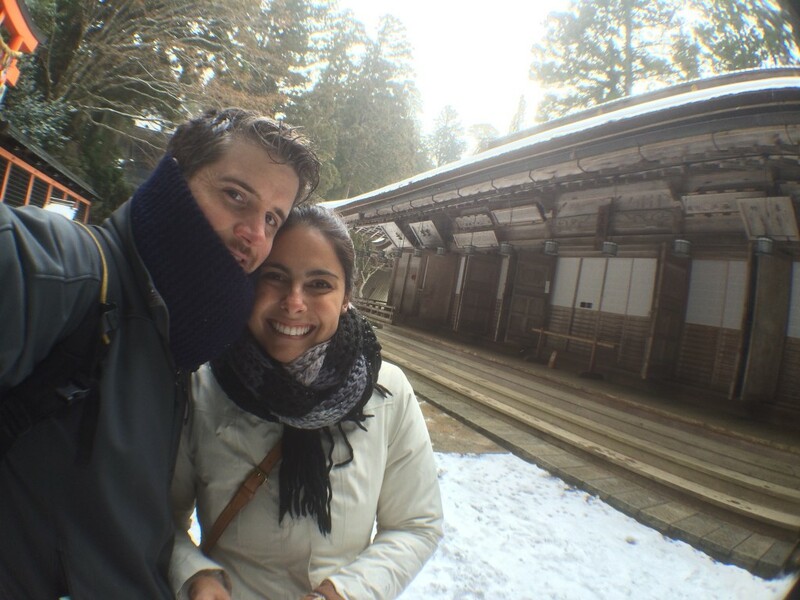 On our first weekend in Japan, we decided to go to a place we read about called Koya-San. 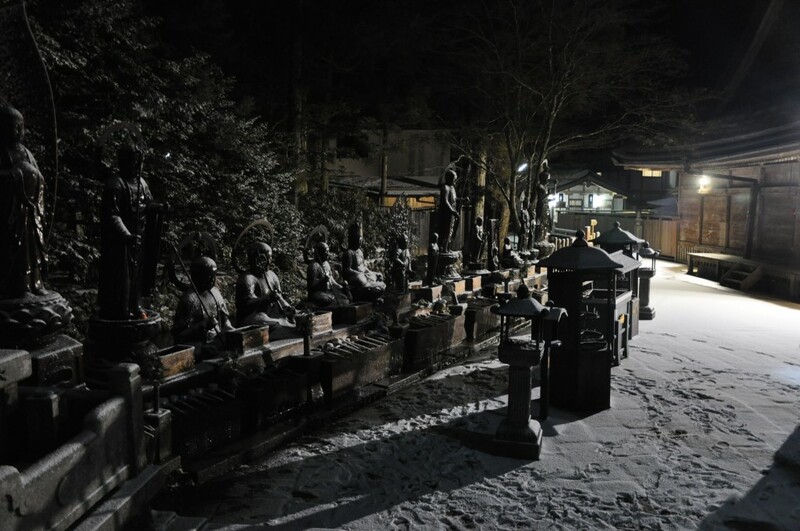 This is a small mountain town a coupe of hours south of Osaka, where a branch of Buddhism called Shingon was founded. 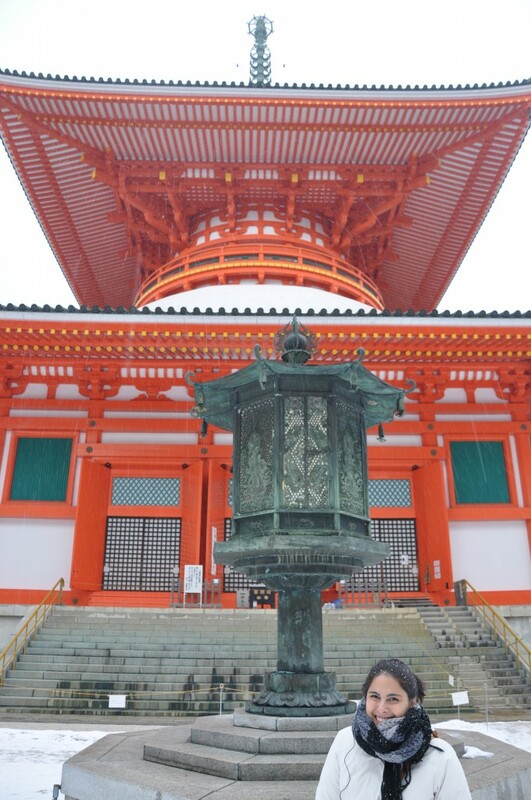 In this town there are many small temples and shrines, and you can actually stay overnight at a buddhist temple! So, once we decided Koya San was the place to go, we set of from Kobe, first by train to Osaka, and changed to the Koya Limited express which took us most of the way. 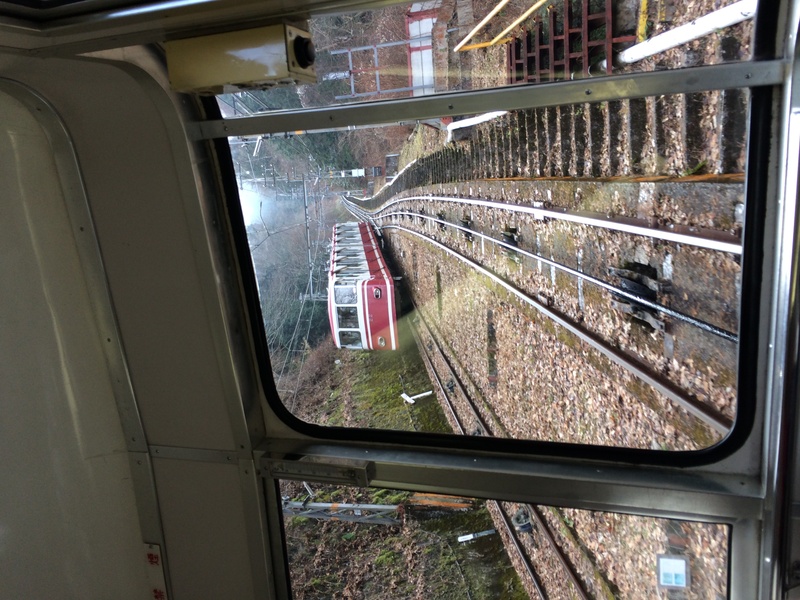 The last small bit of the route is through a very scenic and steep cable car, which takes you up to above 800 m above the sea. 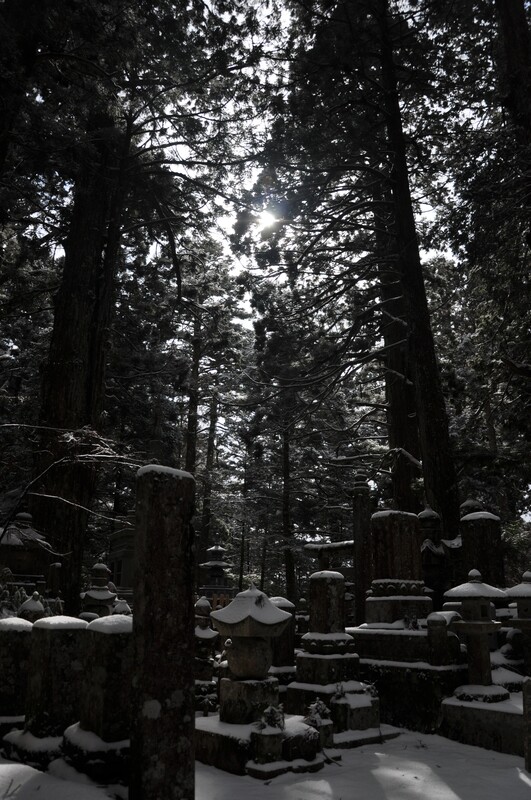 Koyasan is in a valley surrounded by 8 mountains, which apparently is the number of petals in a lotus. 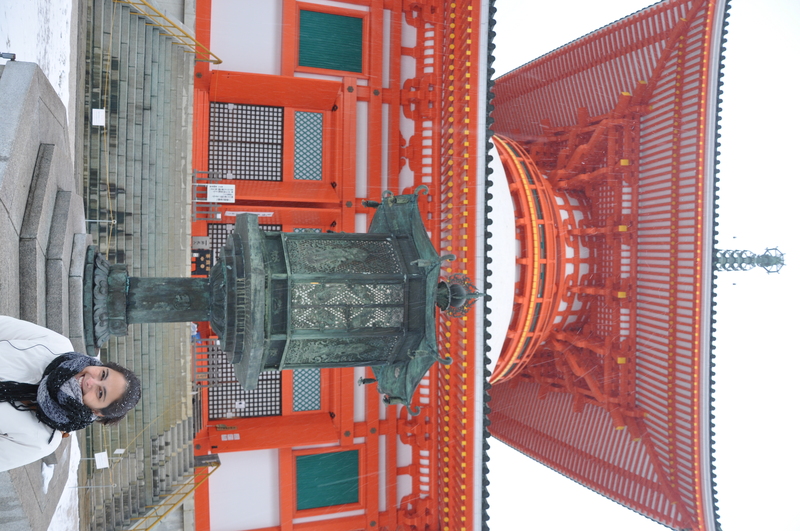 Once we got into town, we walked around many of the different temples and shrines. The weather here was cooooold! It was absolutely beautiful with snow covering everything you could see, but we really had to cover up. Keep in mind that since we moved to Singapore, all of our exposure to cold has come from either standing in front of an open fridge door or blasting the air conditioning!!! 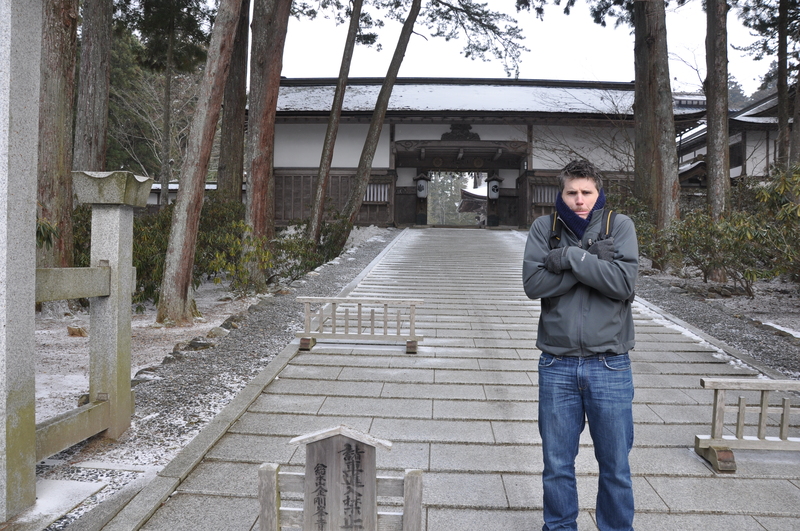 It really was quite cold! Our favourite temple in the area is actually a small complex of temples and shrines calledDanjo Garan (Kon Do, Mie Do, Konpon Daito, etc). There are a few different shrines clustered together, and many very beautiful sculptures and decorations, as well as Torii gates. 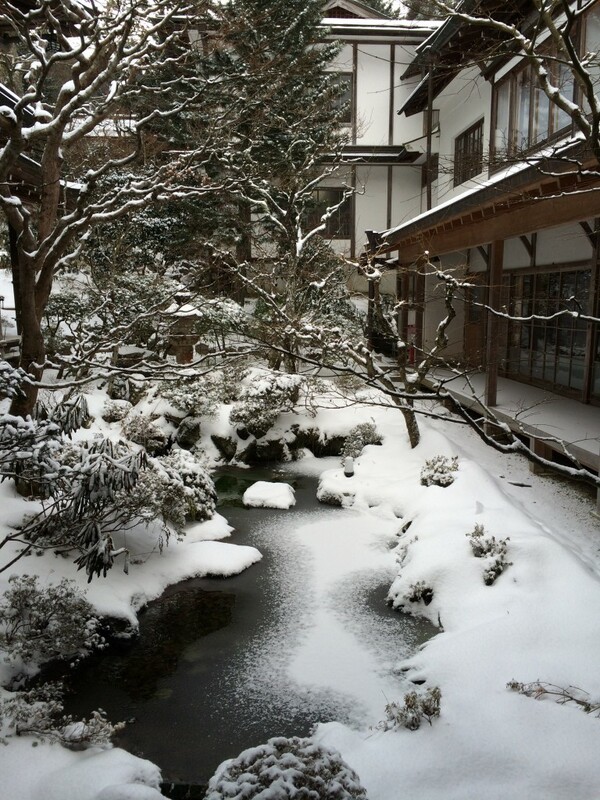 After walking around in the beautiful snow we headed to our hotel, Ekō in (http://www.ekoin.jp/en/). 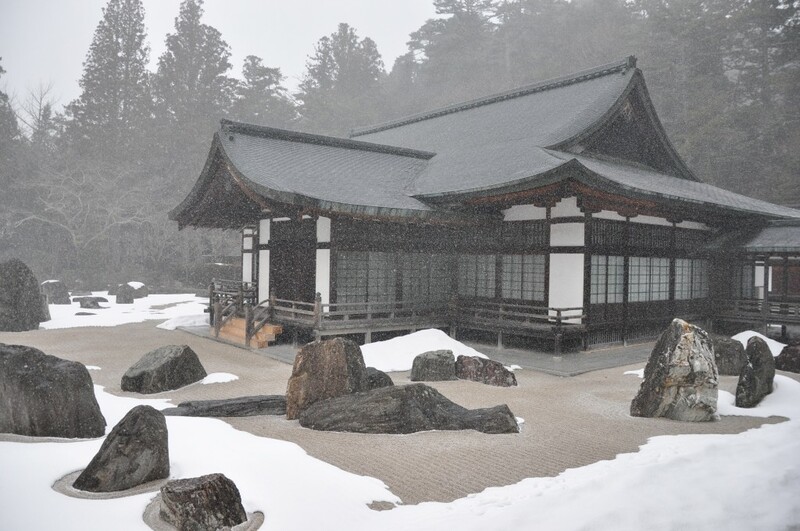 This is a type of hotel called a Shukubo, which is a buddhist temple lodging. There we were greeted by a monk who showed us our room and told us all of the details of the upcoming day, including evening meditation, a very large vegetarian dinner and a night time tour of the cemetery nearby. 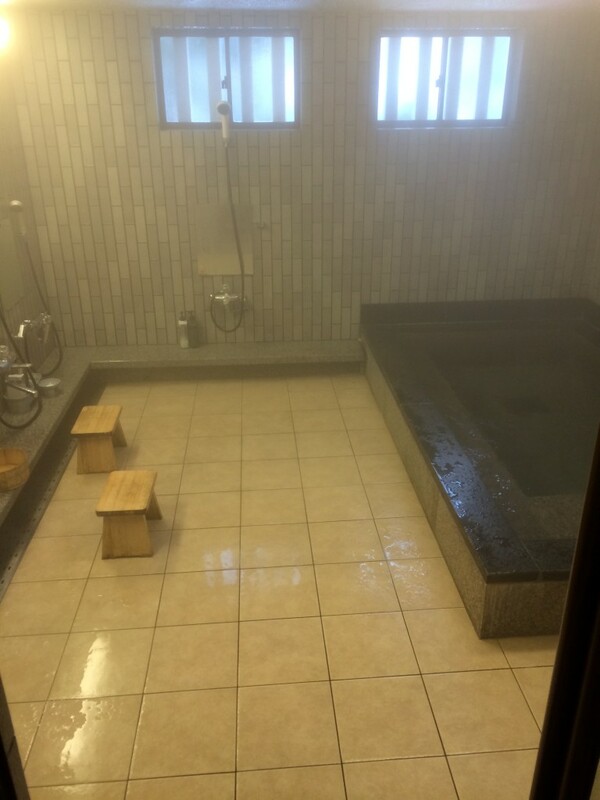 An Onsen (hot Japanese bath) was also available in the premises. 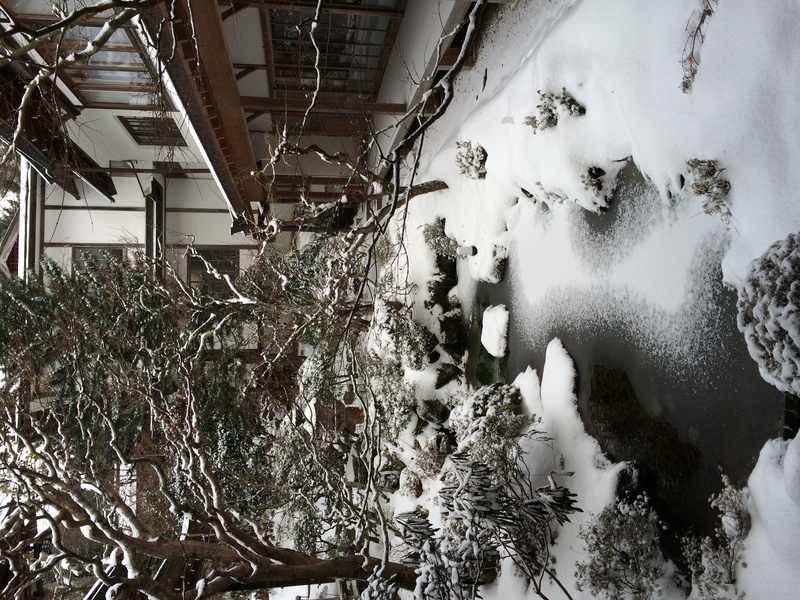 The courtyard of our hotel – imagine seeing this as soon as you walk in! The afternoon started with us heading for meditation, where they briefly explained how they sit and what they do, and then allowed us to relax and think for almost an hour. This was quite a relaxing experience, but clearly it takes years to get a quiet mind! It was so tough trying to think of nothing! Also, it must also take years to be able to sit in a crossed leg position for so long… regardless of this, it was a very enjoyable time. 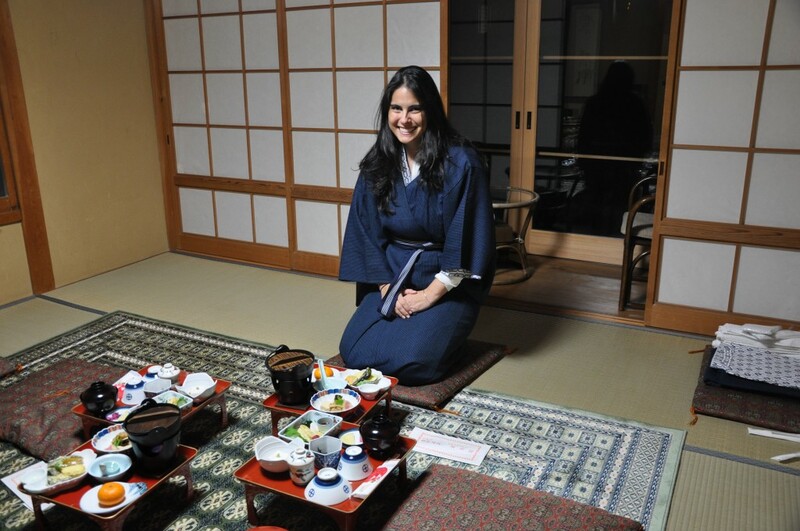 After meditation, we were served dinner in our room. This included more than 15 vegetarian dishes, which were very nice! We really did not know what to expect with the food here, but were pleasantly surpised with a very nice soup and many other tasty dishes. Finally, we wanted to join the cemetery tour which we had heard wonders about. It was only available in japanese that night, but we decided to go for it and it was completely worth it! 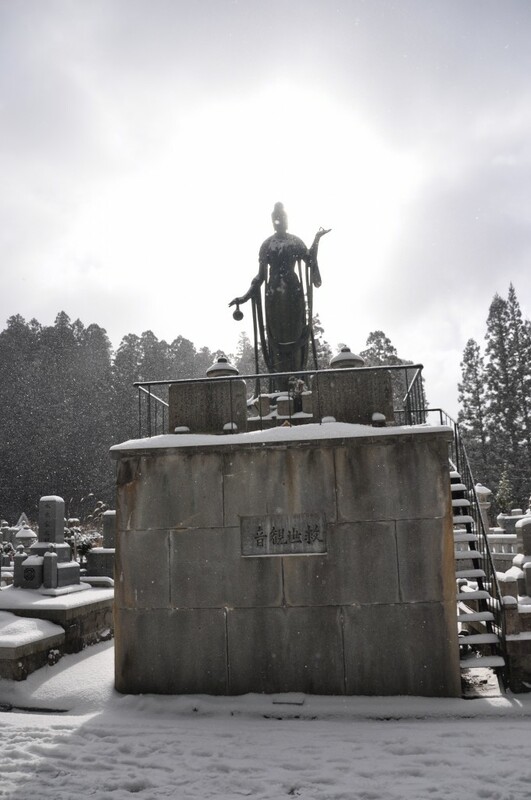 It goes through a very large buddhist cemetery on the end of town, and you see thousands of graves with very intricate sculptures built above. 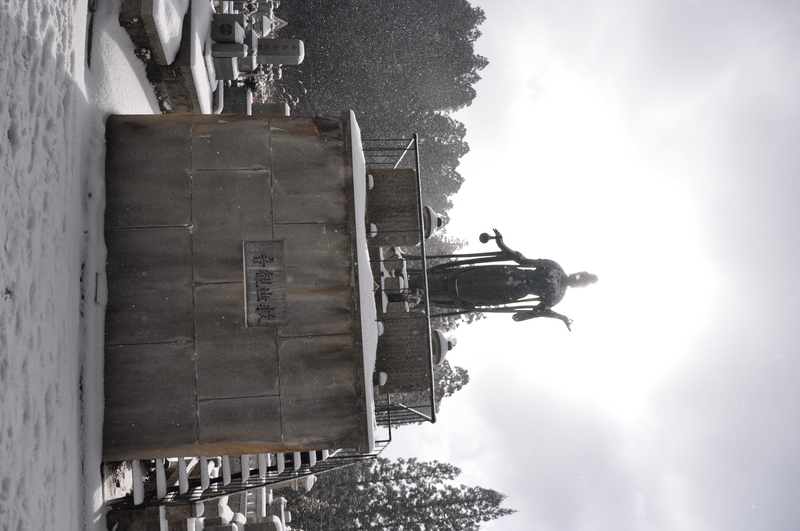 At the end of the tour you arrive at a very large and sacred temple calledOkunoin (Mausoleum of Kōbō Daishi). This place, in the middle of the night, is just beautiful. Then to top it all off, the monk leading the tour breaks out into a very nice chant… the moment was magical! Then it took a 20 minute walk back, where a great hot bath was waiting for us. 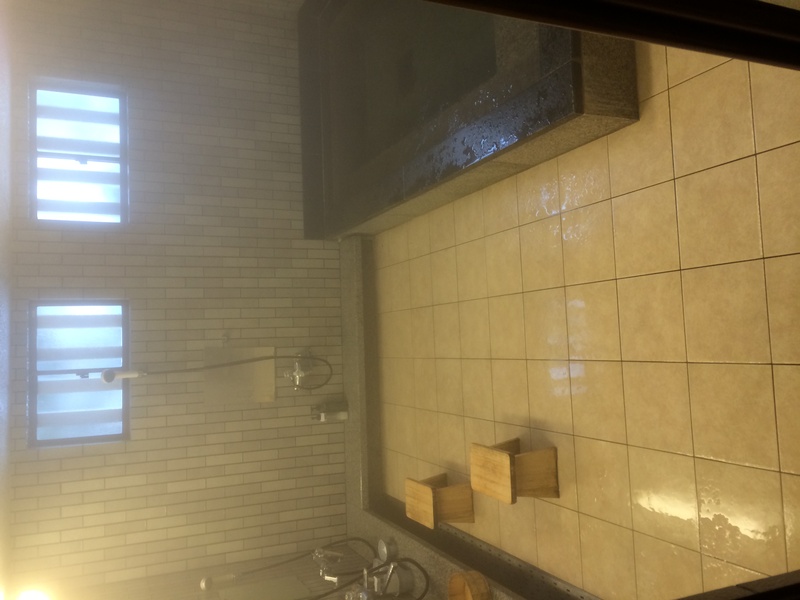 This was our first Japanese bath experience, and did not know exactly what to expect… But essentially to go to a common room where you get undressed, then walk into the bath room and wash off, after which you slowly get into a VERY hot bath. Here, a Japanese man started talking to me in Japanese, clearly asking me about where I was from, and about mexican food, but communicating was tough… he did not know many world in english, and my japanese is sketchy at best! All of this happens while you are in a room naked with strangers. It could have potentially been a bit weird, but it actually was not bad at all! 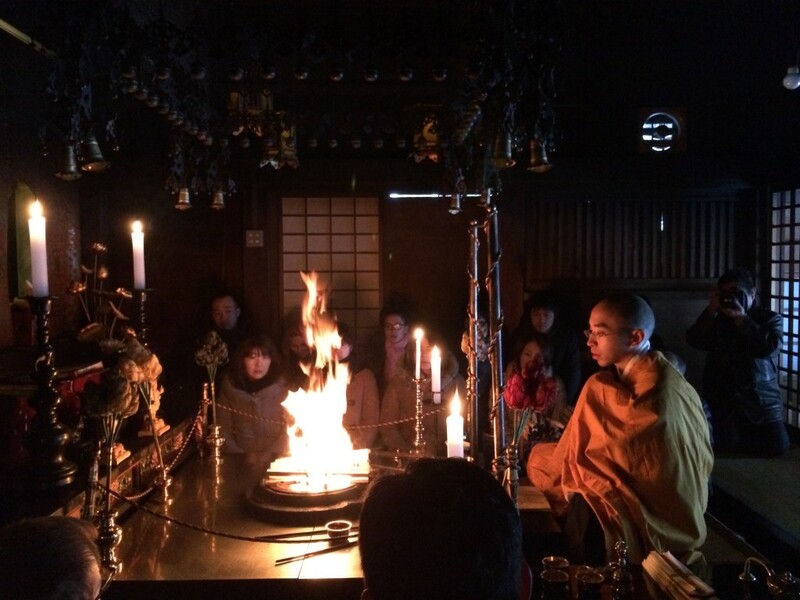 After this, it was straight to bed, as we had an early morning fire ritual to attend! When we woke up, it was straight to meditation at the main shrine, which is an ancient and very ornate temple, together with 2 of the monks. It was a very nice experience with them chanting, but it was just preparation for the highlight of the day, which is the Goma fire ritual. This is a ceremony which is performed once per day in every temple, and we had the privilege of witnessing it. In this ritual, the monks start chanting while one of them slowly builds up a fire which can reach a meter in height or more! It probably took the monk about 20-30 minutes to slowly build it up. When its quite high, they through in some small pieces of wood with wishes you wrote the night before. It was just an amazing and peaceful experience. Sitting in a cold room watching the fire build up while the chants were in the background is just incredible! The fire ritual was truly amazing! 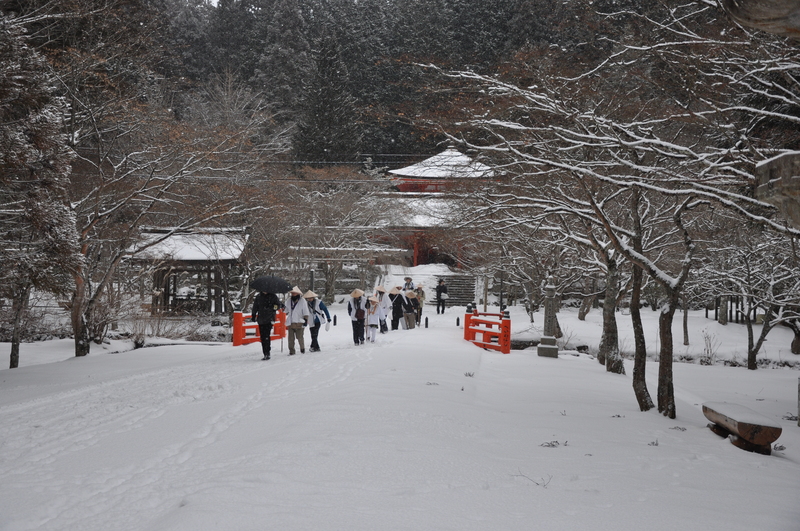 After the ritual it was off to get ready and go for a walk in theOkunoin, the temple we had visited the night before. While we were there, we got a bit of snowfall and everything was covered in a layer of fresh snow. It was beautiful! 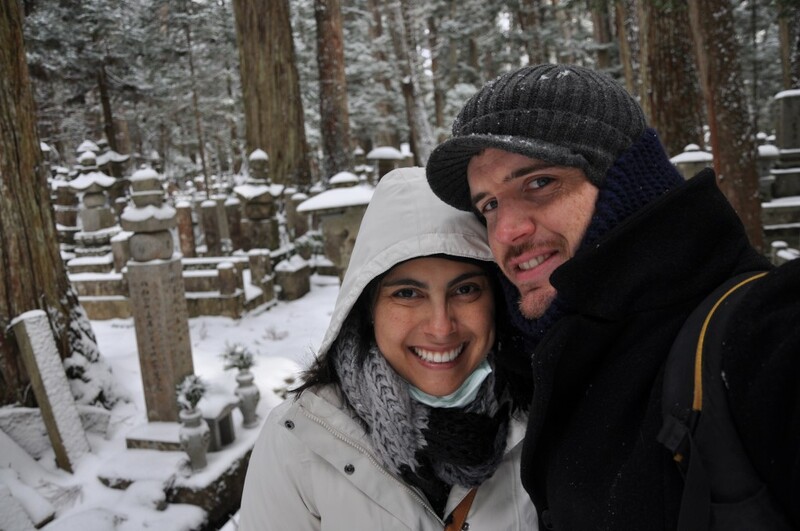 The trip to Koya San was coming to an end as we needed to start heading back to the train station. Walking back we stopped at a very small cafe on the main street, where there was a french woman that seemed to be married to the japanese cook, and a man who looked like her brother…. everyone was talking in Japanese and English and french… and then the guys broke out a cello and a shamisen, like a japanese guitar, and started playing music which they were just making up at the moment. It was a very interesting and different moment! 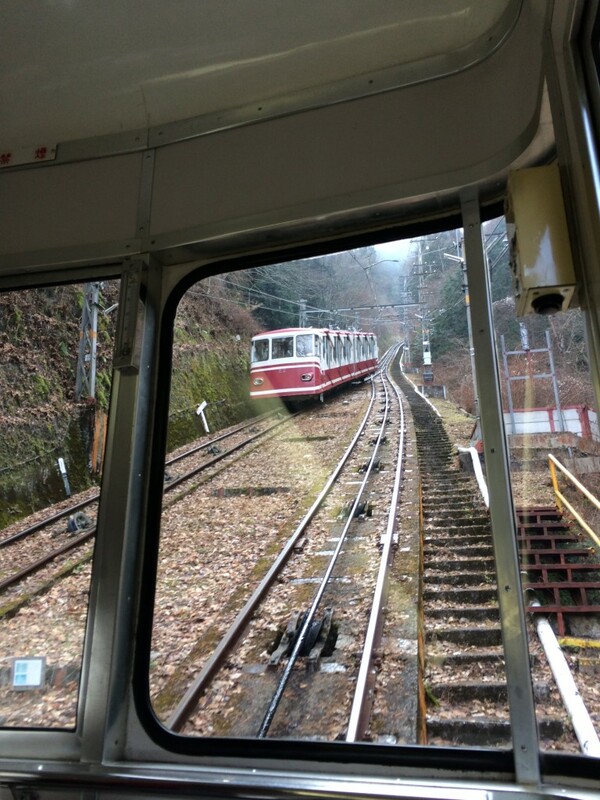 Then it was off, back to Kobe… by bus and various trains. 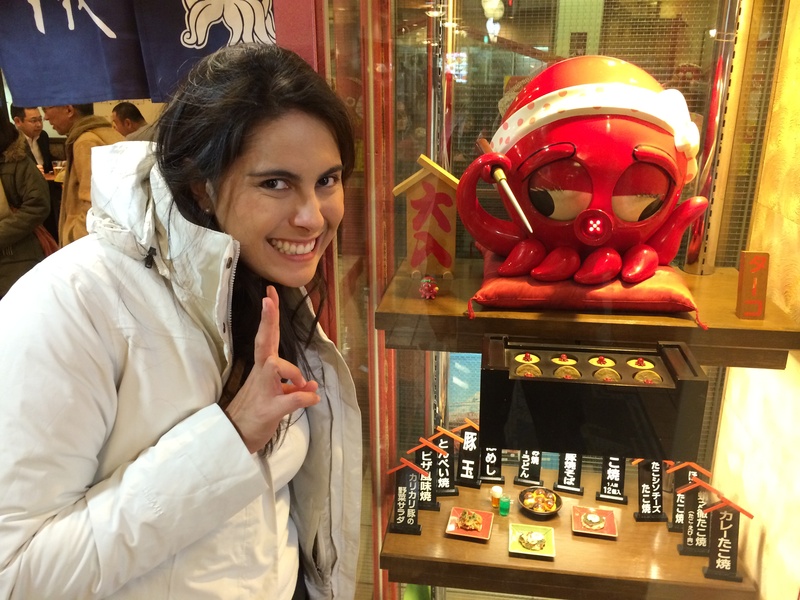 Then, back to Kobe and a week of work! !